We left Minnesota and drove through the North-Eastern corner of Iowa on a very windy day, without knowing where we would find people to talk with. We stopped in Mason City for lunch at a Japanese restaurant – which was surprisingly good considering we were so far from any sushi-friendly coast. I told the waitress what I was doing and asked her where I could go to find people to talk with. 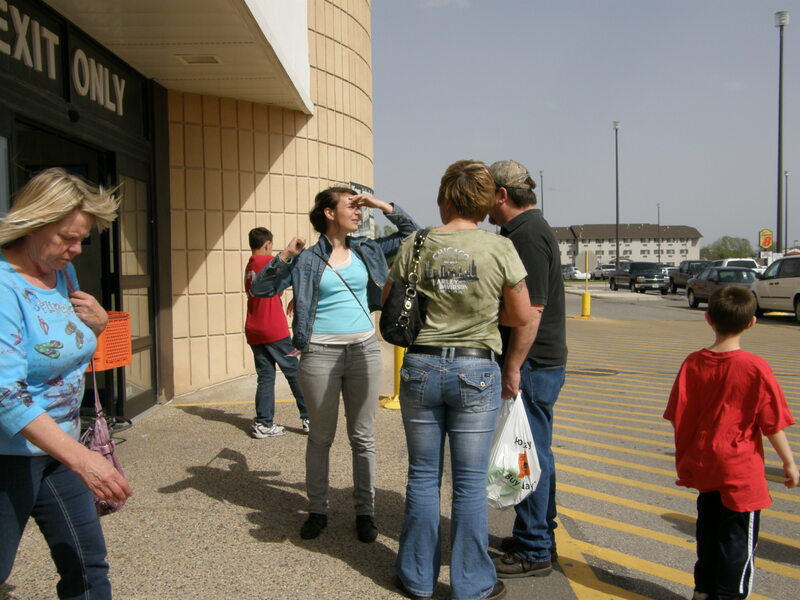 She directed us toward Walmart saying that would be where everyone was on a Sunday afternoon. She turned out to be the wife of the owner and chef of the restaurant, who was himself Japanese. On our way to the Walmart we drove down a street that turned into an endless big box store corridor and by the time we came across a mega-store for farming supplies we decided to stop there instead. I was antsy and worried about whether anyone would talk with me. I stood by the sliding glass exit doors and asked the people leaving if they would tell me about a Midwestern perspective on our country’s politics. It didn’t take long to find people willing to talk. First a couple in their forties stopped and chatted with me briefly. She told me this store was a better choice that Walmart: “people who came here are smarter than the average Walmart shopper.” She was from the area and had left, become a teacher, and lived in Chicago and then Phoenix, but when she lost her job during the recession she had come home. She said since being back home she is getting more conservative again because everyone around her is. She was on unemployment for a while, but she got bored – plus she is tired of people taking advantage of the system – so she got a job as a trucking dispatcher and through that met her boyfriend, the man standing with her. He was concerned with working people being taxed too heavily and wanted people who made under forty thousand dollars to pay no federal taxes. She seemed to disagree and things got a little feisty and hard to follow. I let them get on with their day. Next, a man in his sixties stopped and talked with me for a while. He was calm, well spoken and made solid eye contact. He works full-time in an office at a factory and has a farm, which is also considered to be a full-time job around here. He said he sleeps four hours a night to keep up with the work. Most of the other men in his office have served in the military and, even though he is older than most of them, he turns to them for perspective on foreign policy because he respects their direct experience. He said there is one liberal guy in his office who he has fun riling up by pushing all the liberal issue buttons. He sees that fellow as having a stake in being liberal because most of the members of his family are on entitlement programs, like food stamps and medicaid. He said he cares about conservative foreign policy and economic issues, but doesn’t care about the social issues like abortion. When someone starts talking about abortion he just lets them talk and doesn’t respond. I asked what he thinks is problematic about liberal politics and he said we shouldn’t be apologizing to other countries. I wondered whether he was referring to the Koran burning incident a couple of months ago in Afghanistan. He concurred, saying those books were being used as devices for spying, and that they were just books, and that over 20 service men were killed in the rioting that followed the book burning – why should we apologize for that? I nudged a little further by saying, but wouldn’t Christians have been pretty upset if the tables had been turned and it had been a Bible burning? He said he hoped Christians wouldn’t have killed anybody in such a situation, but his solemn voice seemed to leave room for that possibility. He told me two of his adult daughters had lost their factory jobs because of downsizing and outsourcing. One had been hired back but lost all her seniority and benefits and had to start at the bottom of the ladder again. I said that I associate those kinds of business practices, ones that make sure the company is making money without regard to the employees, as being more a part of the conservative economic policy. He responded by saying that feels badly about how working people are treated in this country in general, and that he doesn’t vote Republican across the board. He has always actively participated in the Iowa caucuses, but didn’t this year because he wasn’t interested in any of the candidates. He said liberals don’t acknowledge how smart it was of Sarah Palin to stay out of this year’s presidential race and that maybe this is the year conservatives are just throwing the election to the liberals. After thanking him and letting him go back to his rare Sunday afternoon where he wasn’t working, I got back into the car. I thought about how both he and the couple mentioned how strongly the community of who they talk with affects their political opinions. In my own life, and through this project, I see how we form mirrored chambers in our lives where the people with whom we talk reinforce over and over again certain ways of thinking, and we find so few chances to even hear any other thoughtful point of view.